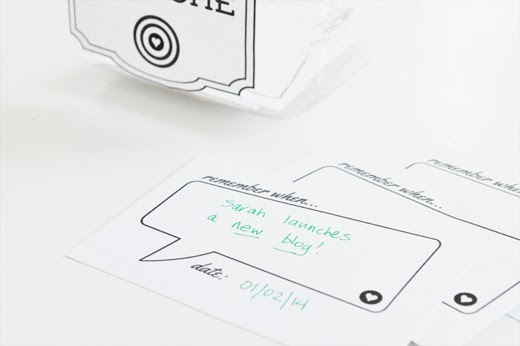 sarah m style: twenty fourteen is filled with awesome + a free printable. twenty fourteen is filled with awesome + a free printable. a fresh start always feels so good. the beginning of a New Year can bring on a surge of motivation, inspiration, and a lofty list of goals. in our home we've chosen to let happiness lead us... and with three little ones, sometimes that merely means we need to simplify and be cool with a calm life. getting out of the house these days is often not an option... right now, one is mastering the art of the tantrum and another is a climber. but, we try not to let that interfere with our enjoyment of the happy little things. twenty fourteen is going to be filled with new memories and we're going to document all those little things using a jar of awesome. we actually did this activity for the entire 2013 year and our jar was overflowing with fun memories and accomplishments like... first steps, first words, a lost tooth, starting preschool, bike camp, special road trips and more. just like a photograph, it's always amazing and uplifting to look back and reminisce on a year's worth of written moments that otherwise may have been forgotten. 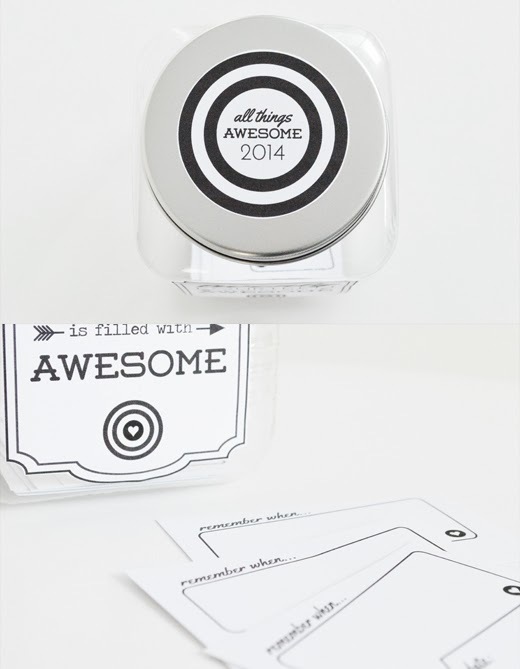 i've provided two free printables for you to craft your own jar of awesome. i printed my labels on full sheet label paper from Staples, however, you can also print them on regular paper and glue or washi them to your jar. i purchased a set of 3 plastic jars from my local dollar store. the second printable is a sheet of cards where you'll write your memory or accomplishment and date. i recommend printing and cropping a stack of these so you're well stocked for a whole lot of awesome. keep your jar of awesome handy spot for a constant reminder to enjoy those little things throughout the year! Congrats on a new year and a new venture, the new blog looks amazing!! So, so excited and happy you are back to blogging! It's lovely, and I agree with Christine, you are stylish, and oh, so talented, and I'm excited to be inspired by you! i definitely think i need to make one of these for 2014. so nice to have a reminder of how much good stuff happens through the year! love the look of your new blog, sarah, congrats on being back out there! hello and welcome to my blog, a delightful little space where i share ideas, inspirations, loves, and bits of my everyday. freebies: I am wild about you valentine + free printable. let's get crafty: DIY apple string art + free printable template and gift tag bookmark. spaces: our creative play space. let's get crafty: s'more teachers like you gift idea + free printable gift tag. let's get crafty: ice cream kit + free printable tags.